Professor Denis Corpet, who co-wrote the original World Health Organisation (WHO) report published four years ago, called the UK's response a "dereliction of duty"
Prof. Corpet urged officials to remove all nitrites from processed meats, in a letter to Health Secretary Matt Hancock and the EU Commissioner for Health and Food Safety. Research suggests these nitrites result in the production of carcinogenic nitrosamines, believed to be responsible for causing bowel cancer. The 2015 report by WHO report classed processed meats as a group one carcinogen, which could cause an additional 34,000 worldwide cancer deaths a year. The Food Standards Agency (FSA) said nitrites are used as preservatives in certain meat products and legislation ensures they are kept at their lowest possible level. "The failure of governments globally to engage on this public health scandal is nothing less than a dereliction of duty - both in regards to the number of cancer cases that could be avoided by ridding nitrites from processed meats - and in the potential to reduce the strain on increasingly stretched and underfunded public health services," Professor Corpet wrote. "It is surely the responsibility of your administrations to educate parents of the risks posed by ham in their children's lunchbox - and to facilitate the growth of safer nitrite-free agenda," he wrote. 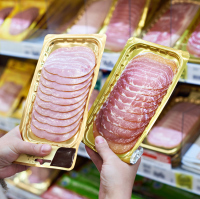 Emma Shields, from Cancer Research UK, said: "The addition of nitrites and nitrates to our food is one of the ways processed meats are thought to increase cancer risk, so this is regulated by the FSA. "But there are other reasons why these meats could increase cancer too, such as smoking and cooking at high temperatures. "Instead of scanning through every ingredient on the packet it's much easier to simply cut down on the amount of processed meat you're eating." If you're living with cancer and looking for travel cover that meets your needs, check out our range of dedicated cancer travel insurance today.